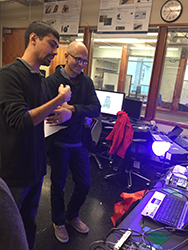 The Ubiquitous Computing (UbiComp) Lab, led by Professor Shwetak Patel, combines expertise in computer science and engineering, electrical engineering, mechanical engineering, and interactive design to create new, end-to-end systems that solve real-world problems. We repurpose existing sensing technology or design next-generation sensors to enable exciting new capabilities in health care, sustainability, smart buildings, and human-machine interaction. SpiroSmart, a low-cost, smartphone-based platform that analyzes lip reverberation to analyze lung function and monitor pulmonary conditions such as asthma and chronic obstructive pulmonary disease (COPD). The relatively low cost and ease of widespread adoption could lead to improved outcomes for patients suffering from chronic lung ailments. 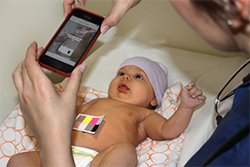 BiliCam, a smartphone-based system that uses on-device camera for monitoring newborn jaundice – a condition that is often present in healthy newborns but which, in extreme cases, can lead to permanent brain damage or death. Initial assessments of BiliCam’s accuracy are very promising, with bilirubin levels estimated with the technology closely matching the serum levels. HydroSense, a single, pressure-based sensor that determines water usage activity at the appliance level. ElectriSense, a single, plug-in sensor that provides device-level usage data on residential electricity – enabling customers to determine the energy consumption of single appliances as well as total energy used. SNUPI (Sensor Nodes Utilizing Powerline Infrastructure), a low-power, wireless platform that uses a building’s power lines to create a network of sensors that can operate on a single coin cell battery for decades. SNUPI Technologies is commercializing this new technology for the home monitoring market. The UbiComp lab collaborates with several industry partners, including Microsoft Research, Intel, and Belkin, and with other research groups on campus. 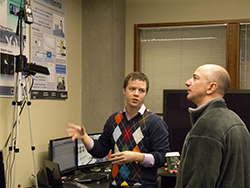 In 2014, UW CSE launched the Taskar Center for Accessible Technology to accelerate the development and deployment of technologies that empower people living with severe motor and speech impairments. The Taskar Center is a multi-disciplinary effort that taps into the expertise of faculty and students in ubiquitous computing, human computer interaction, electrical engineering, human-centered design and engineering, and rehabilitation medicine. Our work has been featured in numerous local and national media outlets, including The Economist, Wired, MIT Technology Review, and GeekWire. To learn more, visit the UbiComp Lab website and explore more of UW CSE’s research in wireless and sensor systems, human computer interaction, and systems and networking – all areas in which our department excels and which contribute to our leadership in ubiquitous computing.